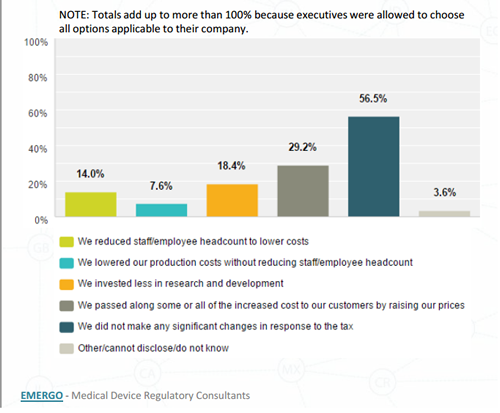 When the Emergo Group asked medical device companies if they made any changes during 2014 in response to the U.S. Medical Device Excise Tax, overall, about 14 percent of medical device firms in the U.S. responded that they reduced staff, while nearly 57 percent did not make any significant changes in response. When Emergo first asked this question in late 2012, about 18 percent predicted they would cut jobs to deal with the tax. Incredibly, 36 percent predicted that they would be able to “reduce production costs without reducing staff/employee headcount.” Clearly, they were not able to lower production costs as expected. Based on the results, Emergo concludes that larger companies are more likely to use staff reduction as a tool for cutting costs than smaller companies, which have less latitude to do so. Emergo also concluded that during 2014, different aspects (pricing, regulatory, reimbursement) of the business appear to have become more challenging. While it is too early to calculate actual 2014 sales figures for the industry, the results would seem to indicate that last year saw more subdued sales growth than 2013. 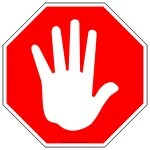 The number of firms reporting sales decreases went from 12 percent last year to 19 percent this year. Reported rates of growth were also lower. 75 percent of the 5,400+ survey participants are positive about prospects for the industry in 2015. Companies located in North/South America and Asia are more optimistic than those located in Europe. China, Japan, Russia and Brazil have become more difficult from a regulatory compliance perspective. Funding/capital is the number one challenge for executives of small companies. Pricing pressure and regulatory changes are biggest challenges for large companies. Companies expect China and US markets to perform well in 2015 compared to others. Larger companies saw more modest sales gains in 2014 compared to smaller companies. Majority of US companies did not make major changes in response to the US medical device excise tax.